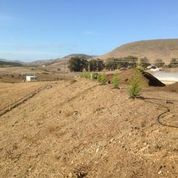 “We planted 45 trees (16 Monterey Cypress, 7 Cotoneaster, 11 Redwood, and 11 Oak trees). For those of you unable to join us this past weekend… There may be an opportunity this upcoming weekend to help plant the remaining 17 Cotoneaster (details to come by the mid point of this week). 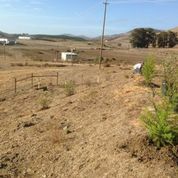 The holes for the 17 Cotoneaster are already pre-dug, which is great news as I’m sure the Cotoneaster crew from this past weekend can attest to, so the planting of the remaining trees will be much easier. 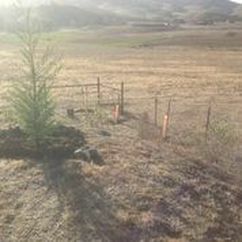 The windbreak will help to reduce wind velocities at the compost unit and enhance air quality in high wind speed conditions. Additionally, it serves as an aesthetically pleasing component to the unit and a carbon sink for carbon dioxide emissions. The compost unit processes over 7.5 million pounds of manure from on-campus sources such as the Beef Cattle Evaluations Center (BCEC), Dairy Unit, Poultry Unit, Horse Unit (Equine Center), and Rodeo Unit. This reduces cost for hiring an outside entity to handle the “waste.” Moreover, the compost provides a stable, humic-like material that provides a slow release source of nutrients for plant/crop uptake. The compost is also used as dairy bedding for the Dairy Unit. A special thanks goes to the 3 major organizations that helped to fund and put on the tree planting event. Also special thank you’s to Kevin Piper (Ag Ops), Lionel Johnston (One Cool Earth), Greg Ellis (One Cool Earth), Hunter Francis (Center for Sustainability), and Kate Grossmith (Center for Sustainability). And, of course, thank you to all you wonderful volunteers. If you have photos please add them to the DropBox folder by clicking on the below link. I have posted a few pictures of the semi-finished project.